IOCL Recruitment 2018 – Apply Offline for Trade & Technician Apprentice Posts: Indian Oil Corporation Limited (IOCL) has advertised a notification for the recruitment of 1340 posts of Trade & Technician Apprentice vacancies. Eligible candidates can apply online from 17.10.2018 to 09.11.2018. 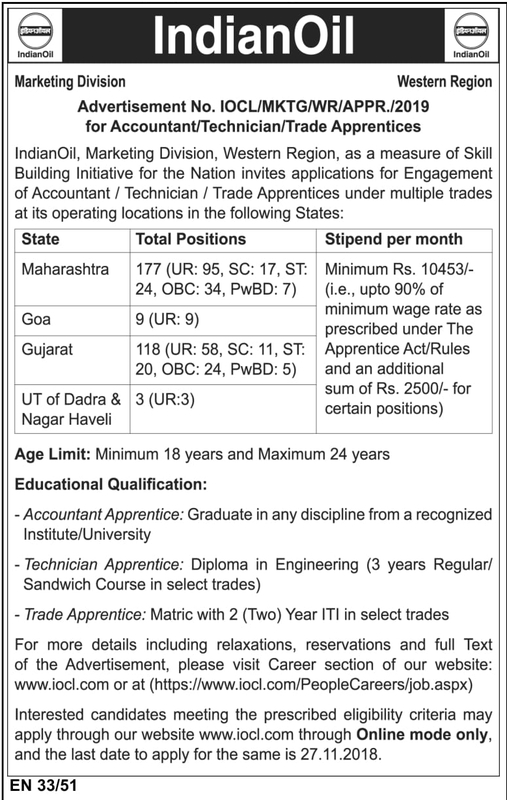 Other details like age limit, educational qualification, selection process & how to apply for IOCL Jobs are given below. Selected candidates will get Rs.14,715/Month by the Recruiting Organization. Eligible and Interested Aspirants are requested to Download Application Form from Below link of iocrefrecruit.in Website and Submit it to the mentioned Address before the Last Date i.e., 09.11.2018.